Construction work in the Reference Room on the 1st floor of the library will begin the morning of Wednesday, July 20th, and be completed before the start of the Fall semester. During this time, Reference Desk services will move to the 2nd floor group study area, and remain there until construction work is completed. The Reference Room Computer Lab will be closed during construction. ITS computer labs are available on the 1st floor of the library in the north-east part of the building, and on the 2nd floor along the windows on the north side of the building. USF students, faculty and staff can also checkout laptop computers at the Access Services desk. When you think of Gleeson Library, do you think of printers? Most of the students who enter through our gates do, and I can’t blame them: I’m practically obsessed with the printers in the library since they tend to be the most used on campus. You may have noticed that the campus has switched to printing through the photocopiers, a system dubbed Pharos. 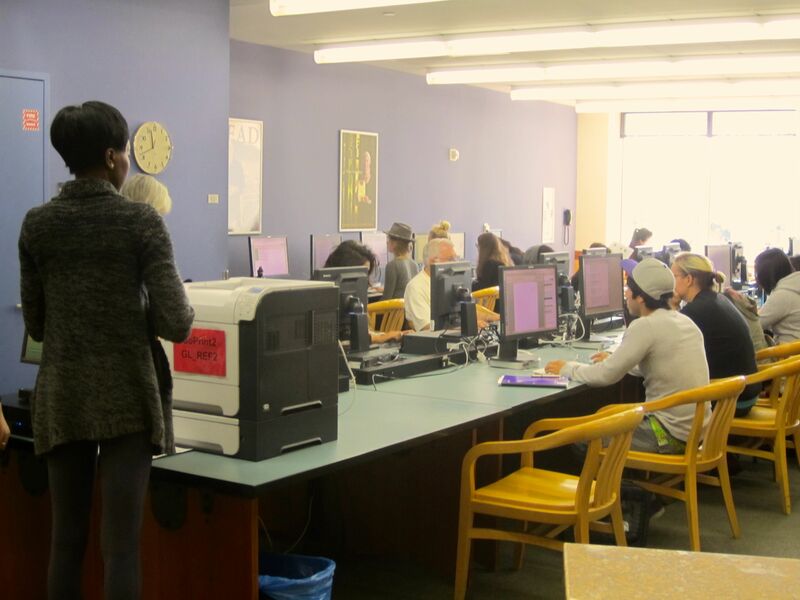 You may have also noticed the computer lab in the Reference department of Gleeson Library is still running on the old system, the retro GoPrint. On Monday, October 14, 2013 (the first day of Fall Break), the computer lab in the Reference Department of Gleeson Library will be closed so we can take out GoPrint, put in Pharos, and make sure everything is working correctly. We will have two dedicated Pharos black and white printers in the lab and one job-selection screen. Once the equipment is installed and the computers are correctly configured, you can send print jobs from anywhere on campus (personal laptop/desktop or computer lab) and you can pick them up anywhere on campus (just find the nearest Pharos/Ricoh brand copier/printer)—the computer lab in the Reference Department will be just one more location you can do both. Book Club is breaking out of our habit of reading books about boys/kids who have lost their fathers! April 13, 2012 (Fri), 12-1 pm: A Private Life by Jane Smiley. Room 209 of Gleeson Library. Gleeson library doesn’t have a paper copy of this one (yet? ), so you’ll have to request it through Link+ (comes fast–in about 4 business days! ), or read it on one of our iPads or Kindle. If all else fails, the public library has it in many formats. May 11, 2012 (Fri), 12-1 pm: Storyteller : The Authorized Biography of Roald Dahl by Donald Sturrock. Probably in room 139 of Gleeson Library, or if the weather is nice, the USF Community Garden… stay tuned for updates. Gleeson does have a copy of this, but it’s checked out. You can request it through Link+ and the public library has a few copies available. Of course you can also read it on one of our iPads or Kindle. The USF Book Club is run by Kelci Baughman McDowell, Reference Library Assistant in Gleeson. For information or to sign up for the mailing list, email kbaughmanmcdowell@usfca.edu. You can visit our wiki for more info, as well. (Please note, you do not have to join the wiki to view it.) No rsvp for the meeting is necessary–just drop by if you’ve read the book or if you’re interested in it. Lastly, feel free to bring your lunch. See you in April!